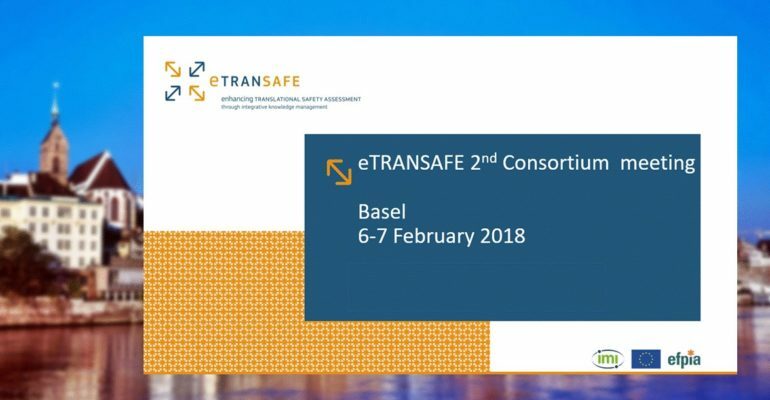 On the 6th and 7th of February, the eTRANSAFE Consortium partners met in Basel to discuss the progress of the first six months of the project. Key topics such as data collection, interoperability, and integration were discussed. One of the project aims is to develop predictive services, contributing to the safety assessment of chemical compounds. Integrative analysis of preclinical and clinical data for generation of candidate translational biomarkers is another important goal of the project. Overall the Consortium was impressed by the progress made in almost all activities and the good team collaboration established in the different WPs. The need to get data as soon as possible was highlighted as one of the main challenges in this initial phase of the Project. Carlos Díaz presented the Project management principles and the creation of a task force aimed at addressing the collection of data (both preclinical and clinical) by the EFPIA companies from a common perspective. Since eTRANSAFE is expected to build upon the success of eTOX, the access to eTOX assets (eTOXsys, OntoBrowser, etc.) is a pressing matter, for which important steps have been taken. Eva Molero insisted on the need to consider the sustainability implications of any decision made in the project from the very start, and the importance of promoting and disseminating the information and the knowledge generated by the project.